I am pleased to inform you that construction on the future One Chicago Square project, located at 1 W. Chicago, is now underway. Crews are beginning to prepare the site for construction of a mixed-use residential sproject. 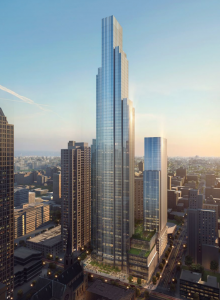 Construction is expected to take up to 42 months to complete the 55- and 88-story towers and will be built in three phases. My staff and I met with Power Construction, who is the General Contractor for the project. I have been provided a direct line of communication to Power, therefore, ANY community concerns should be made known to the 2nd Ward Office so that they may be resolved quickly. Power Construction and its subcontractors are required to abide by the construction noise ordinance, which allows construction noise only during permitted hours (8:00 AM to 8:00 PM). Please note that crews may begin staging work before 8:00 AM and staging work may include some low volume activity. Over the last week, rodent abatement crews have been on site, aggressively baiting the site for rodents in and around the existing structures on the Dearborn side of the block. The structures are expected to be demolished within the next two weeks. Abatement will remain a priority item as the project moves forward over the next three and a half years. The Chicago Fire Department will be using the three abandoned buildings for training exercises scheduled to begin this week, before the structures are demolished next week. Engineers are underpinning the foundation at Bella Luna and Brite Cleaners, which will remain open during construction. This is a necessary step to ensure that the building is undamaged and secured ahead of the foundation excavation phase of the project. Crews are installing construction fencing on-site and establishing a protected sidewalk around the site. Around the exterior perimeter of the site, parking restrictions will be in effect on Chicago, Superior, State, and Dearborn along the curb only. Dearborn will experience loss of one traffic lane, beginning in early 2020 to accommodate on-site truck and equipment staging. During this time, street lights will be moved onto temporary poles, which will be maintained by City Lights. Any outages along the site, please report to my office or to 3-1-1. The first phase that may cause minor disruptions or inconveniences will involve excavation for the site foundation. Power informed my staff and I that they expect to be excavating and pouring approximately 500 yards of material per day — approximately twelve trucks worth of material — for approximately six weeks. Power Construction will monitor construction site vibration around the community as well. Power Construction and all subcontractors working on the project were notified that they must have flaggers and street sweepers on-site to ensure that the neighborhood is kept as clean as possible during the duration of the project. To minimize traffic disruptions during the excavation phase of the project, trucks will stage four blocks away in a permitted area, and will only be allowed to travel to the construction site after they receive radio confirmation to proceed. Once on scene, trucks will enter the site perimeter. No trucks will be allowed to idle or stage on the immediate blocks touching the site. Finally, the site will have comprehensive video and human security to ensure that the construction site is safe. Power has assured my office that they will maintain the barricades and fencing and address any graffiti as quickly as possible. Your patience over the duration of the project is greatly appreciated. Any questions, comments, or concerns with this project should be directed to the 2nd Ward Service Office by email (Ward02@cityofchicago.org), or call (312) 643-2299. To learn more about the project, visit the One Chicago Square website.